I initially trained as a Clinical Scientist where I worked in several London based Medical Schools and Hospital Research Departments for 20 years. My spare time has always been filled with creative pursuits including painting, dressmaking, knitting, crochet, paper making, silk painting and fabric dyeing, embroidery and beading. I love creating ‘one of a kind’ clothing, accessories and soft furnishings, and particularly love to use recycled materials; giving a new lease of life to old clothing and textiles, transforming them into something new. I also like to use scrap papers, plastics, metals and foils, broken jewellery and beads in my work – all ‘rubbish’ has potential! I have just started a City and Guilds Embroidery Course and will be using this blog to showcase my work. I also love beadwork including jewellery making and beaded embroidery; silk and fabric painting including shibori and tie dye; felting using both wet and needle felting methods; weaving, knitting, crochet and basket work, and more recently I have got into spinning too! Basically I love anything to do with textiles, fabrics, threads, or beads and wish that there were more hours in the day to create and play. Initially I trained as a Clinical Scientist. My spare time has always been filled with creative pursuits including painting, dressmaking, knitting, crochet, paper making, silk painting and fabric dyeing, embroidery and beading. 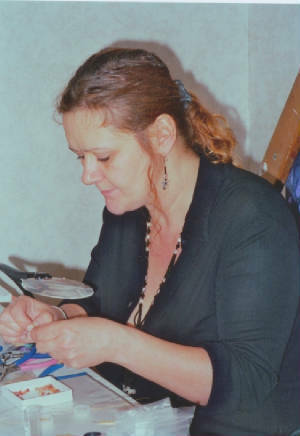 I am now self-employed and will soon be re-opening my EBay shop (http://stores.ebay.co.uk/heatherwelljewelleryandtextiles) selling patterns and kits to encourage others with their own creative pursuits. Thought you might like to see the bag I made. I used beautiful embroidered upholstery fabric offcuts for the main, contrasting with striped remnants for the handles and inside bag facings. 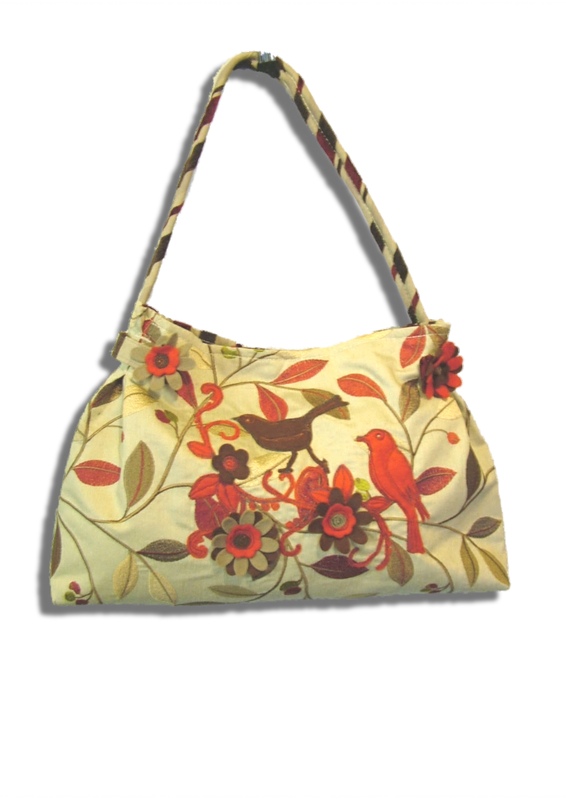 I applied some die cut felt flowers and birds - and secured with free machine embroidery. I really enjoyed making it but I need to service my heavier duty sewing machine - my Janome just would not cooperate with stitching through the thick fabric areas! It is the first proper sewing that I have done for a while so progress was very slow - but pleased with the final results. Please get in touch and let me know what you think of this site.